There’s a lot of talk about the shift to digital and predictions about the demise of newspapers. However, studies by Pew Research Center show that “most newspaper reading still happens in print.” As such, newspapers still present a viable advertising vehicle, especially for small businesses. Despite its decline, newspapers still have a wide reach. The Newspaper Association of America reports that circulation of both daily and Sunday newspapers reaches about 83 million. The quality of newspaper readers are hard to beat: they are typically upscale, with about 20% of its readers earning $100K and higher. About 25% of newspaper readers are college graduates and higher, and significant number are employed in professional or managerial positions. 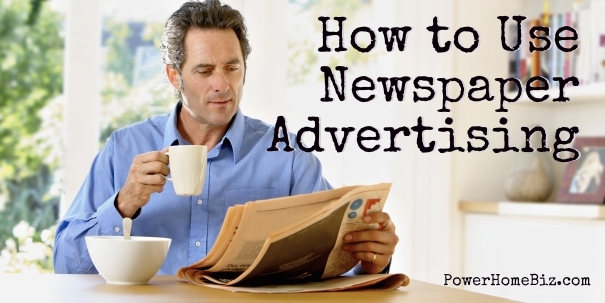 The different types of newspaper advertising allows you to target your ad placement. Newspaper advertising has extremely short deadlines that allow ads to be created and placed in a matter of days. Newspapers are passive, non intrusive media. They tend to reach only buyers who are looking for the product. They are poor at reaching prospects before the need arises. Display advertising from one column wide by 2 inches high to a full two pages, display ads can be so numerous the news stories have to be cut so both can live on the page. There is usually no protection. Competing store ads can be next to each other (next time you see the paper look for tire store ads on the same page). When designing your ad, remember it’s all about them. Use a catchy headline and tell them what you will do for the. Forget about your picture or your “Number One in the District Award”. Good advertising “feels their pain”. The effectiveness of classified ads varies by paper and by who wrote the ad and by what the ad is selling. Many classified sections have turned into giant car dealer pages and huge homes for sale sections complete with four color pictures. The small, private, “gotta sell my Bow-Flex” ads can be lost in a giant classified section. Many shoppers and Nickel Savers have smaller, and cheaper, classified sections. Some small business operators find success with a series of small classified ads. Small blurbs tend to build “top of mind awareness” and is a relatively cheap way to keep your name out there. Tabs, the cash cow for newspapers, are manufactured events designed to sell ads. Progress Edition. Easter Shopping Special. Dollar Days. You name it, there is a tab every idea. Tabs get ad-on advertising dollars from existing clients and offer one time only exposure to those who don’t normally use the paper (i.e. the giant corporate ads in every Progress Edition). Most papers have so many tabs, they print an advertising calendar. Understand them for what they are, vehicles to get extra bucks from you. If you want to be in one, rearrange your budget, don’t ad to it. Some Sunday papers weight 4 to 5 pounds each, mostly for the weight of stuffers and inserts. Usually reserved for national advertisers and big box stores. They print them and deliver them to the paper and pay a per piece fee to have them stuffed and delivered. For smaller businesses they become cost prohibitive. Better to stick with display ads.